This shooting did not completely grab my attention until I heard it happened in my old home area of Thousand Oaks/Newbury Park where I lived for a year just over the hill from Dean Martin. (I was on the wrong side of the hill.) But it is a really quiet, laid back area where these things do not happen, even in bars. 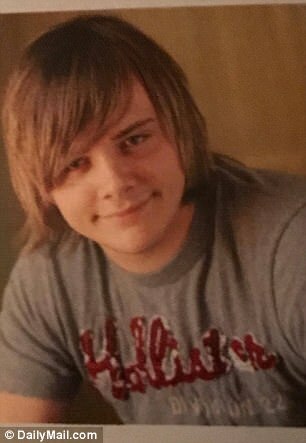 Ian David Long, Before Meds? Ian David Long, After Meds? 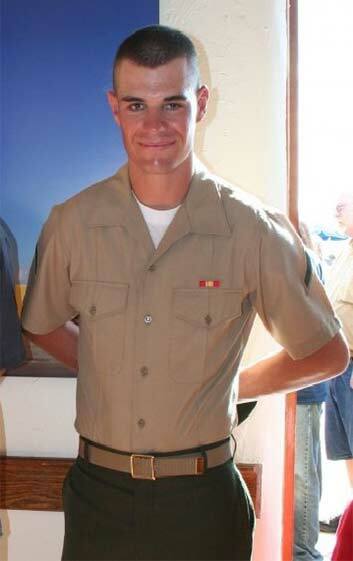 The shooter Ian David Long, 28, was an ex-Marine who was honorably discharged in 2013. Curtis Kellogg, a friend who served with Long, said Long headed to Southern California to pursue a degree in sports medicine after his service in Afghanistan. And as this article does point out he had mental health issues – PTSD for which the military freely hands out antidepressants which CAUSE PTSD! My first thought upon hearing this news that this happened in Thousand Oaks, home of Heather Locklear, was “I hope it was not Heather going off the deep end yet again on her antidepressants!” She was arrested twice earlier this year for attacking officers and in another incident where she nearly bit off her boyfriend’s nose! No surprise with biting being such a common adverse reaction to antidepressants. 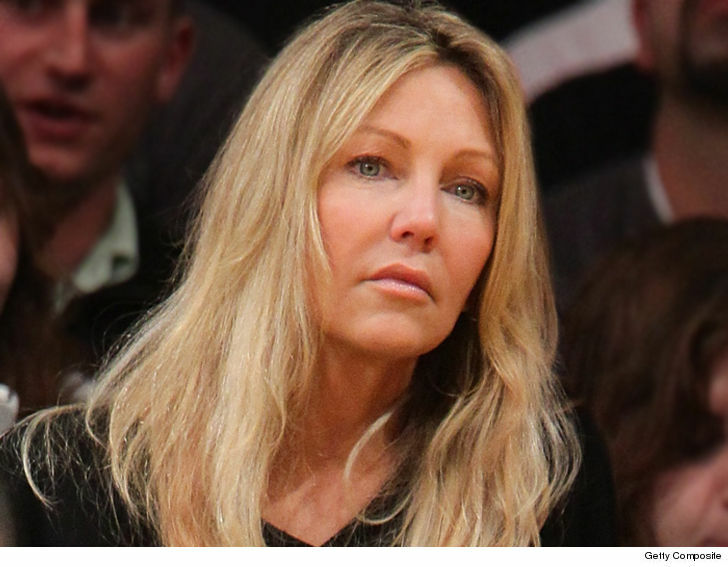 Heather Locklear pleads not guilty in her domestic violence arrest/officer attack. These drugs certainly do not help you win any beauty contest!!! 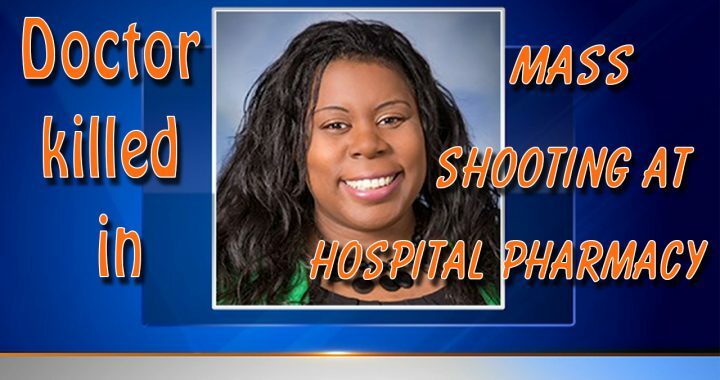 How Do These Random Shootings Happen? 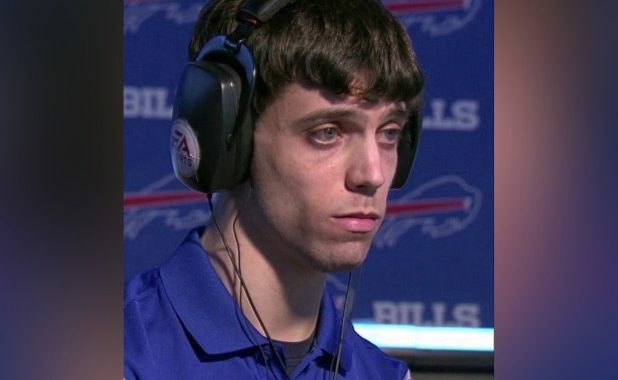 Watch the first hand account of a boy who could have been Adam Lanza or Eric Harris…learn the common denominator in 68 school shootings over the past two decades as 16-year-old Corey talks about the day he took a rifle to his high school and held 24 classmates hostage. Everyone has heard that serotonin is this wonderful “happy” chemical we need to no longer be depressed or anxious while the research for decades before these drugs hit the market told us the exact opposite! Serotonin produces all kinds of mental issues, including depression, anxiety, suicide, psychosis, violent crime, etc. Bio: Ann is the author or the first book ever written on the adverse effects of SSRI antidepressant medications & other drugs designed to increase serotonin. 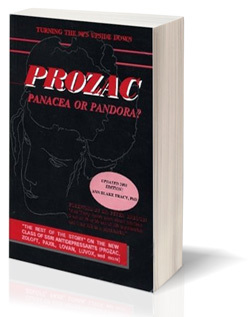 That book, The Prozac Pandora, a basic introduction to potential problems with this class of drugs, came out in 1991, just before the first FDA hearing on Prozac. By 1994 that had expanded into, Prozac: Panacea or Pandora? The Rest of the Story, a large text on these drugs & the damaging effects of increasing serotonin, which had long been known in medical science as a “stress neuro-hormone.” The book was being ordered by the case by EMTs to hand out on calls after becoming alarmed by how often they were seeing these drugs in all the emergencies they were called out on. A pharmacy students were discoveringenough about these serotonergicdrugs after the book becoming required reading in their pharmacy class that one student even wrote a popular rap song to address it called “Get Off The Pharm!” That first edition was followed by a second edition in 2001 and a third edition on this Prozac family of serotonergic drugs in 2014 available only as an ebook on our drugawareness.org website & titled, Prozac: Panacea or Pandora? Our Serotonin Nightmare! 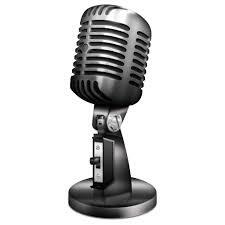 Since 1992 Ann has testified as an expert witness in Prozac and other SSRI related court cases around the world. Some of the more high profile cases she has worked on would be the murder/suicide of comedian Phil Hartman and his wife Brynn, the Columbine & Red Lake School shootings, Andrea Yates – the Texas mother who drowned her five children, the Atlanta Day Trader, Princess Di’s death, the murder/suicide of the royal family of Nepal, Anna Nicole Smith’s son Daniel’s death, etc. Ann Blake-Tracy will amaze you with documentation as to how often these drugs have lurked silently behind the scenes of major headlines worldwide!! To get an idea of the types of reactions & how often we are seeing these in the news go to www.drugawareness.org for breaking news cases and www.SSRIstories.NET for our database of thousands of articles on patients on these drugs and the adverse results appearing as headlines. These are cases which Ann Blake Tracy, along with many of our directors, over the years have been gathering since 1990. Then our Texas director, Rosie Meysenburg, along with her husband Gene, began to post the stories into an online database in 2006. With only a handful of individuals gathering the cases it should be clear that this shocking list is only the tip of this iceberg of horrifying antidepressant-induced nightmares! 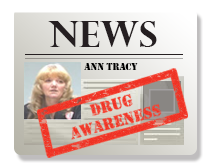 Ann Blake-Tracy is the executive director of the International Coalition for Drug Awareness. She has has specialized since 1990 in adverse reactions to serotonergic medications as well as the new atypical antipsychotics. She has discovered that most lone wolf shooters have been medicated on some form of SSRI antidepressant. Can a possible side-effect be homicidal ideation in the client? 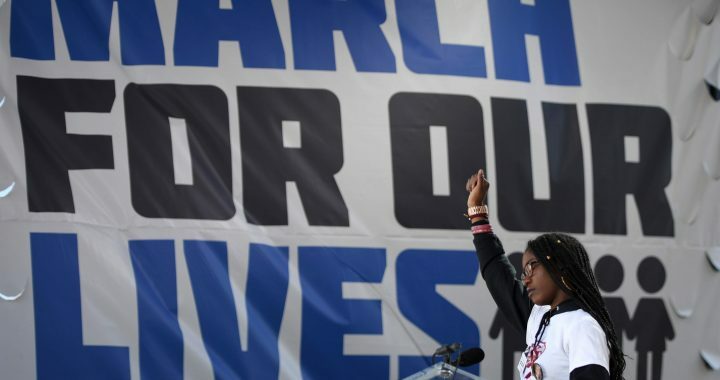 Richard continues the discussion with the Executive Director of the International Coalition for Drug Awareness who are warning the public about the dangerous side effects of prescription medication which may include homicidal ideation. She offers alternatives and safe ways for withdrawal. Safe Withdrawal MP3: Help! I Can’t Get Off My Antidepressant/Atypical Antipsychotic! Dr. Candace Pert, the discoverer of the opiate binding process. 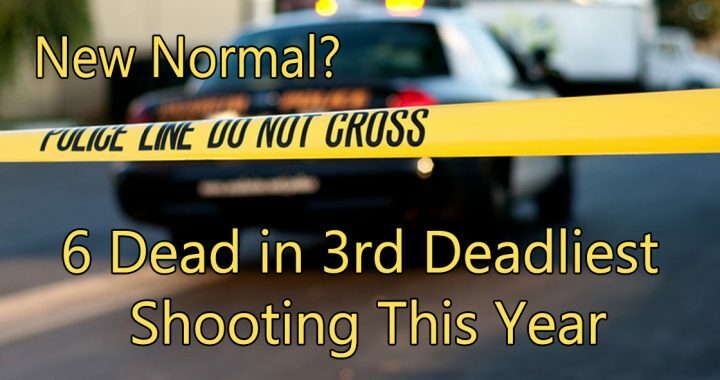 I can tell the sheriff WHY this is the “new normal”! 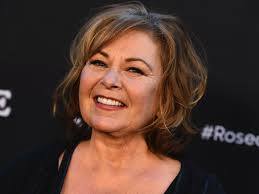 Perhaps he has forgotten having to pick up Roseanne Barr years ago while under the influence of Prozac when her way to Salt Lake City to kill her parents because her Prozac delusions we’re leading her to believe her parents had sexually molested her at only 6 months of age. Years later while appearing on Oprah this is something that she publicly stated was the result of adverse reactions to her medication. You could tell how difficult it was for her to even discuss and she called it “the biggest mistake” of her life. Of course this was after coming off the drugs and realizing what had happened. I was overjoyed to see her angel mother next to her as she told the world the truth about what happened. Sadly her father passed away before he had a chance to hear it. What these drugs are doing to destroy family relationships in so many ways is absolutely criminal! Adverse effects can come quickly and with much intensity for people with serious head injuries like Roseanne had when she was only 16. This was a life threatening injury where she was hit by a car leaving her with the hood ornament imbedded in her forehead! So where was her warning? Where is that warning with these drugs? Why was that never given? 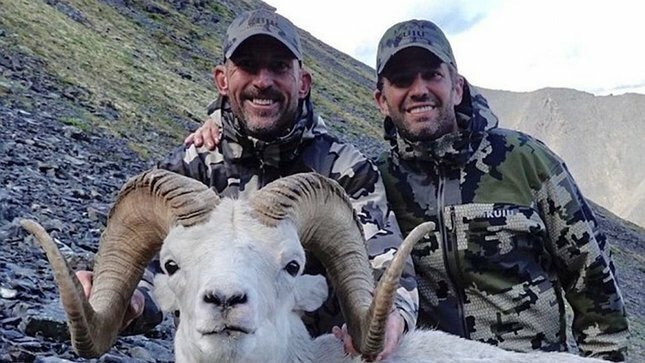 Jason Hairston & Donald Trump, Jr.
Is that lack of warning why Donald Trump Jr’s hunting partner, a former San Francisco 49er, Jason Hairston, also a survivor of a very serious sports related head injury, just days ago killed himself? I have very little doubt! The last stats I heard found that 75% of football players have had head injuries & everyone wonders why it is often men who have these adverse reactions resulting in violence from these drugs? The only antidepressant I have seen carry very strong warnings about taking it if someone has had a serious head injury is Wellbutrin. Yet the rest of them, as far as I know, have never carried the warning for those with previous head injuries. This is not new! We have seen serotonin induced violence long before this and in fact Sheriff it was law enforcement and judges who put an end to it then because of the extreme violence they saw as the result of it. And what was it Sheriff? It was PCP, a drug which mimicked serotonin. It was on the market for 7 years with the public being told the drug had a large margin of safety in humans. Obviously as everyone learned that statement was far from correct! That drug was pulled from the market right about the same time that Congress banned another drug which mimicked serotonin. That drug had produced much suicide across the country along with the Public’s introduction to the violence it could produce in the way of introducing the world to Charles Manson. That drug was LSD, the CIA drug of choice or mind control. The same drug that the CIA used 80% of their initial budget to purchase all of the LSD that Sandoz pharmaceutical had on hand to use in their mind control experiments. We learned later that most of those CIA experiments we’re done on the General Public and the military. Is that what we are seeing again? To me it seems more than obvious. 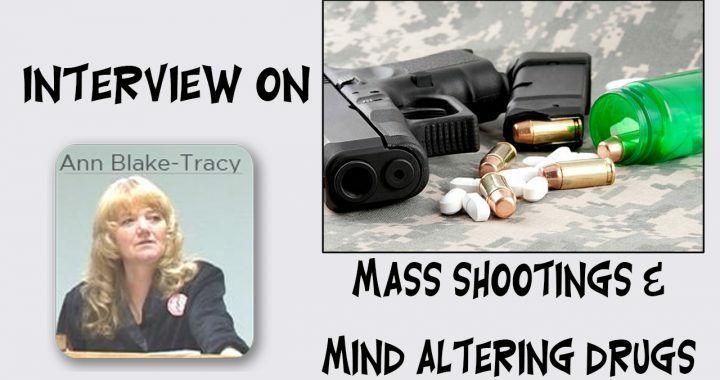 This is the “new normal” Sheriff because there is just too much of everything that increases serotonin which results in the increase of violence. And that serotonin research indicating an association with elevated serotonin and extreme violence was done right in your own back yard Sheriff at the University of Southern California. It would seem to me it is long overdue that law enforcement and judges wake up to this and step forward once again to protect us from this! 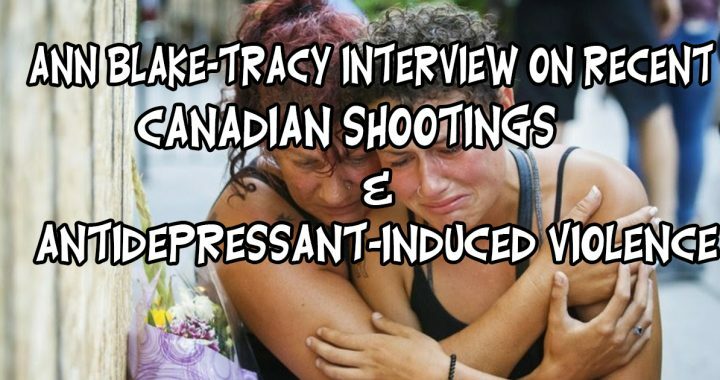 Canada is a country with very strict gun control laws yet this past month they have had two major shootings…the first shooting was on July 22. We no more than finished that show and posted it the following week when there was yet another shooting where four lost their lives, including two police officers. 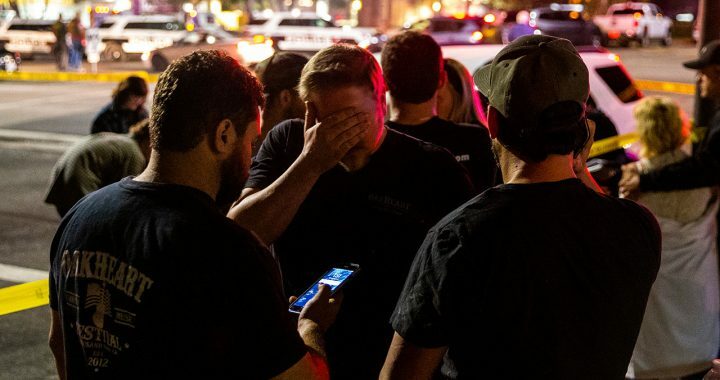 TORONTO — A shooting in a small Canadian city early Friday left four people dead, including two police officers, under circumstances that were not yet explained but struck a nerve in a country that has been roiled in recent months by several instances of mass violence. 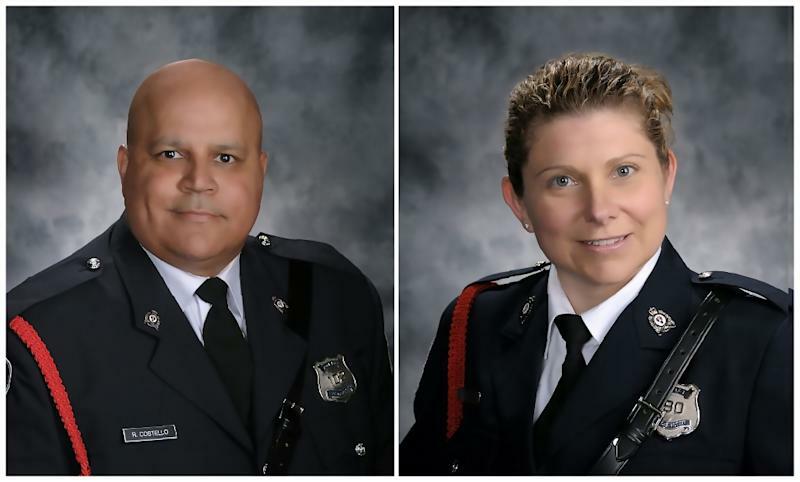 People in Fredericton, the capital of New Brunswick in the eastern part of the country, said they heard as many as 20 gunshots following a confrontation that prompted police to initially cordon off a large section of the city with emergency vehicles and order residents to remain inside their homes and businesses. 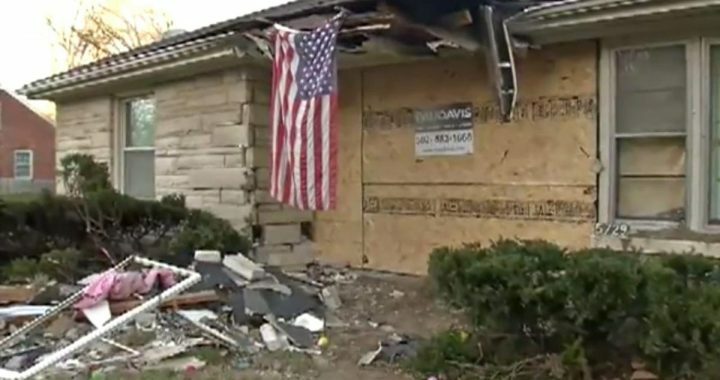 See link to original news story below…..and keep the following information in mind as you read what happened in this case. Then ask what on Earth we are doing to the future generation with our mass drugging of children! A shocking 63% of Autistic children are given antidepressants! So should anyone be surprised by this kind of action taken by a child on one of these drugs? Not when you look at the science behind it…. Research over the last 50 years show that increased serotonin levels produce impulsive behaviour, murder and suicide, arson, violent crime, reckless driving, depression, anxiety, irritability, pains around the heart, insomnia, abuse of alcohol and other drugs, difficulty breathing and tension. In one research study, patients with poor serotonin metabolism (which therefore produces high serotonin levels) were observed to suffer from irritability and sleeplessness, tending to sleep on the edge of consciousness, awake at the slightest provocation and not be able to return to sleep. Other symptoms observed were pains around the heart, difficulty breathing and worsening of bronchial complaints. They tended to suffer spontaneous abortion. One of the main functions of serotonin is the constriction of muscle tissue. Serotonin levels are high in schizophrenia, autism, mania, mood disorders including depression and anxiety, organic brain disease, mental retardation, Alzheimer’s and anorexia. 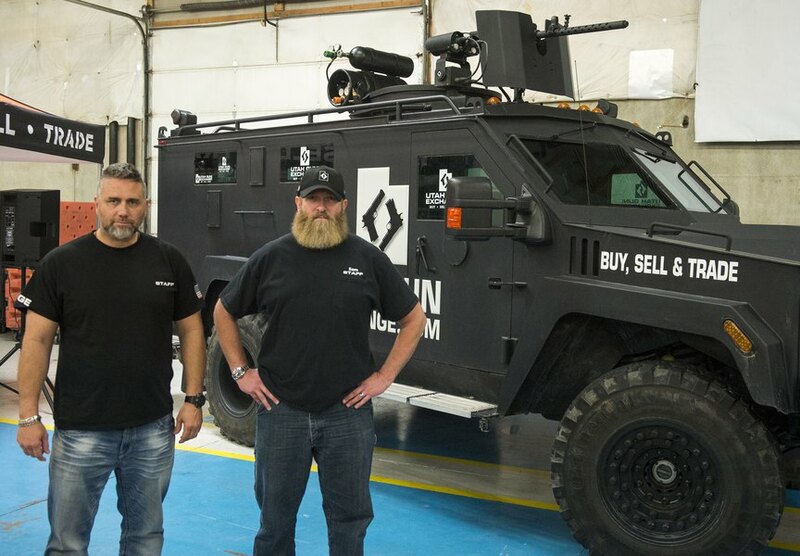 NOTE: It appears that after joining the military the aggression becomes more physical. Consider all the vaccines added to the mix of meds plus the military’s notariaty for drugging begins to rear its ugly head as they begin to drug him for aggression according to his wife. 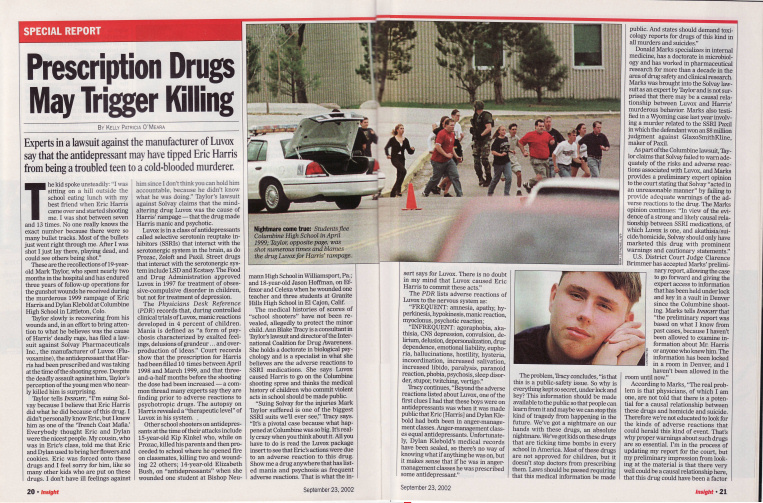 What we have found over the years is that Paxil was generally the antidepressant given for “anger management” but what Eric Harris at Columbine was given was Zoloft. After six short weeks on Zoloft Eric was so frightened by the intense homicidal ideation he was experiencing from the drug that he reported it to them and asked that something be done about it. 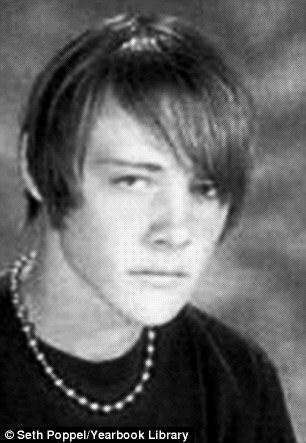 Sadly and tragically for both Eric and dozens of his classmates at Columbine their only solution was to change the brand of the antidepressant that they were giving him! So on the new antidepressant Luvox Eric went on with the homicidal ideation that Zoloft had triggered for him and we all saw the end result. 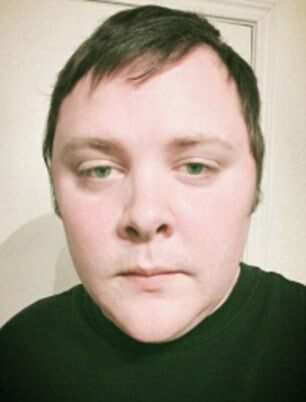 So what the information that he was being given this type of drug by the military I have absolutely no doubt that this shooter was definitely taking an antidepressant drug when he killed everyone in Texas this last week as they sat in church! 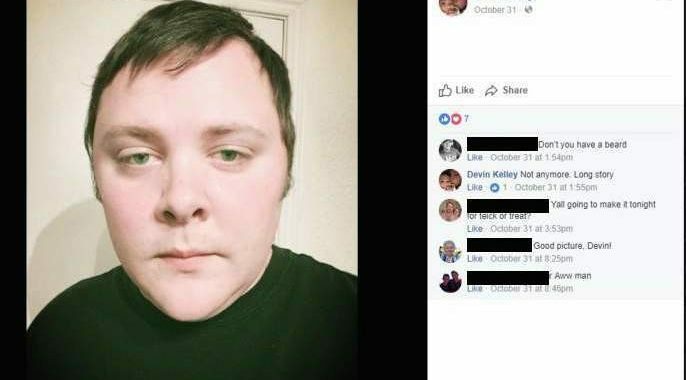 Please stay tuned for the next blog post I include or you where you will hear from the Christian Broadcasting Network Pat Robertson declare with no doubt in his voice whatsoever that this Texas church shooting was the direct result of antidepressants! 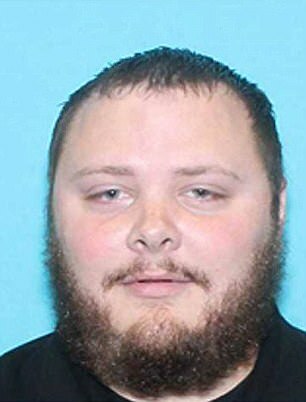 Ralph Martinez tells Daily Mail that he was Kelley’s best friend from age 12 to 19 years old. “He was like a brother to me at the time,” Martinez says in an exclusive interview. Martinez said he had a lot in common, both of them were super-hyper active. Martinez says he took prescription medicine for his ADHD until he was 19 and Devin took prescription pills for the same thing for as long as he can remember…. For Kelley’s 21st birthday Martinez flew out to New Mexico with his girlfriend, where they spent a long weekend with Devin and Tessa where they were living at the time. 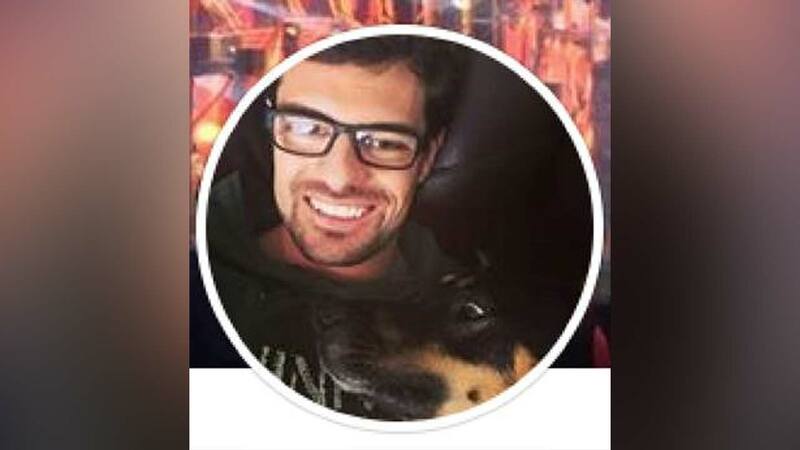 “While we were in New Mexico at one point my girlfriend saw some prescription pill bottles in their kitchen and ask Tessa what they were for,” said Martinez. “Was this dog abused?! Whatever the abuse was, the abuse she is suffering now from that “behavioral vet” has to be far worse than anything she may have ever had before! Putting her on multiple medications (call them what they really are – drugs!) is little different than confining her to Auschwitz!!! The abuse is now mental and emotional, on top of physical, as she goes in and out of withdrawal from powerful mind altering drugs as with this vet switching her meds – a withdrawal humans report is at least 10 times worse than heroin withdrawal!!! “Poor innocent thing! As if she did not suffer enough abuse already! 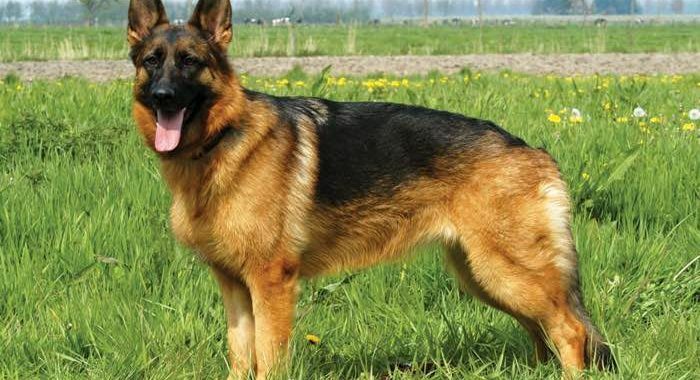 Now if someone will VERY GRADUALLY, VERY, VERY GRADUALLY (taking months, not days or weeks after a year of being drugged wean her safely down off those drugs she will begin to go outside, get rid of her anxiety (since all these drugs CAUSE or increase anxiety), not cure it, and she will become a happy, healthy, normal dog! 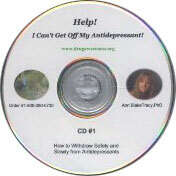 Our website at www.drugawareness.org has an MP3 “Help! I Can’t Get Off My Antidepressant!) on how to wean safely & how to calculate how long someone needs to take to do so safely. 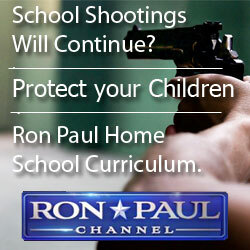 “Here is a website database with about 5000 similar cases including most all school shootings: www.SSRIstories.NET. Please take a look at that list and then ask yourself how many times we as a society need to stick our hand in fire in order to realize it burns?! These drugs are a death sentence physically as well as mentally and emotionally. Just two weeks ago one of the most extensive studies I have seen demonstrated that antidepressants increase one’enhances of death by 33% and increase the rate of heart attack and stroke by 14%.